Nearly half – 47% — of tablet and smartphone users feel that mobile ads are informative and / or helpful, up from 22% in 2013 (a 113% increase). 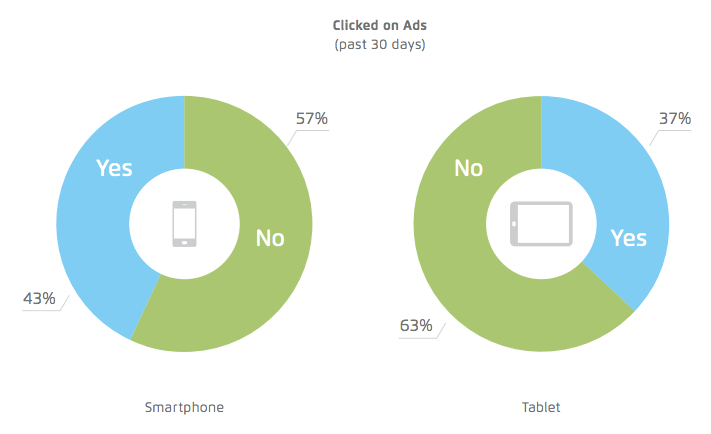 43% of smartphone users have clicked on a mobile ad in the past 30 days. 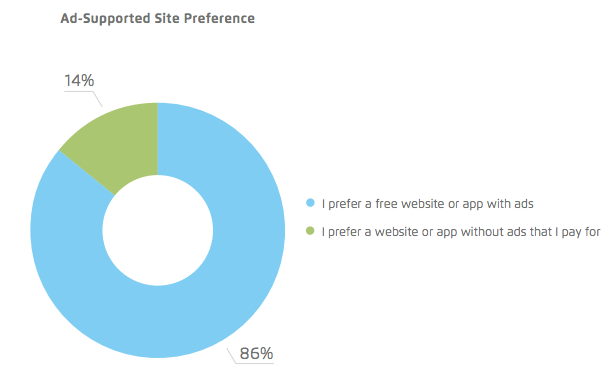 86% of mobile users prefer an ad-supported, free website or app to a paid website or app. 82% of mobile users have no problem with ad-supported content if that content is otherwise free. The survey results paint a picture of a mobile consumer base that not only accepts advertising as a component of the mobile experience but has come to appreciate the presence of ads in mobile content. There are a few reasons why this could be true. 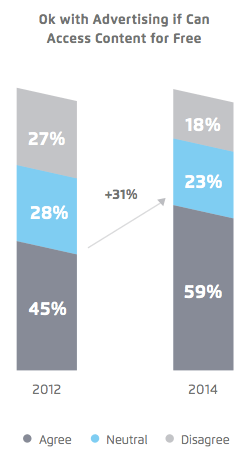 On mobile, app discovery is driven almost entirely by advertising. It’s possible that consumers recognize that the idiosyncrasies and platform realities of mobile render app discovery via search impossible (on the web, search results algorithms are driven heavily by analyzing page links; this approach isn’t relevant for mobile). If consumers acknowledge this, then they may also see advertising as the only possible engine of app discovery – the only means of finding new apps. From this perspective, ads could be perceived as very valuable. 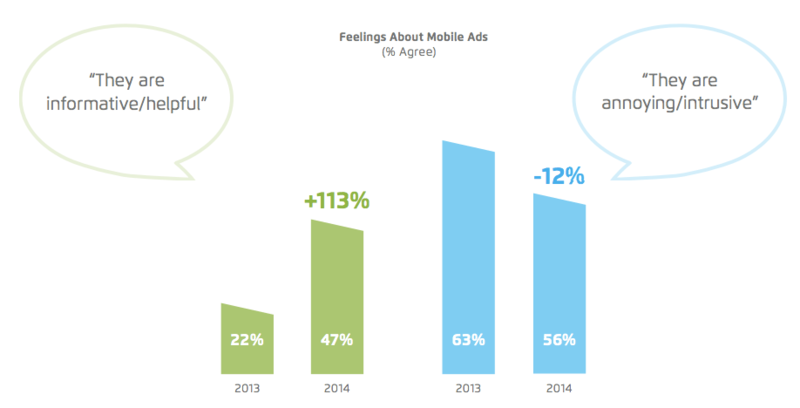 Mobile ads are more immediately relevant based on geography than desktop ads. Consumers may use mobile ads as a form of price discovery and comparison while shopping in brick-and-mortar stores. In the case of searching for and researching products while physically present in a store, ads are far more intent-driven than they ever could be on desktop (acknowledging the fact that many web searches are made with the intent to buy immediately). 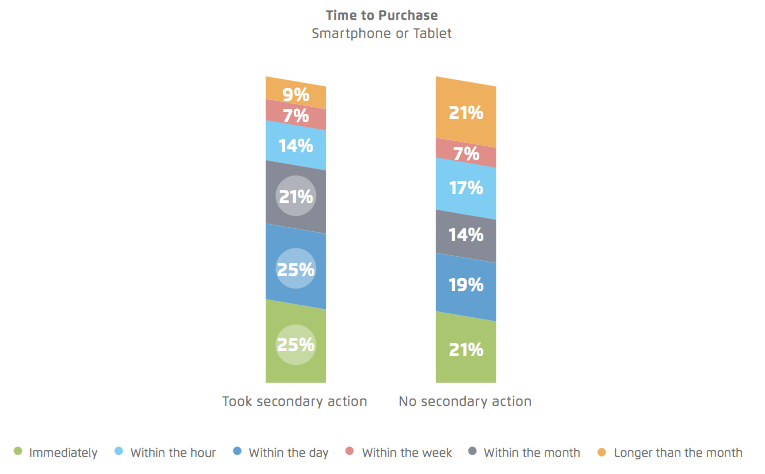 The Mobile Path to Purchase survey affirms the efficacy of this hypothesis: 71% of users that took a secondary action with a mobile ad made a relevant purchase within a day of doing so. Consumers may see mobile ads as helpful tools in the physical product evaluation process. Mobile ad formats are conducive to social sharing. 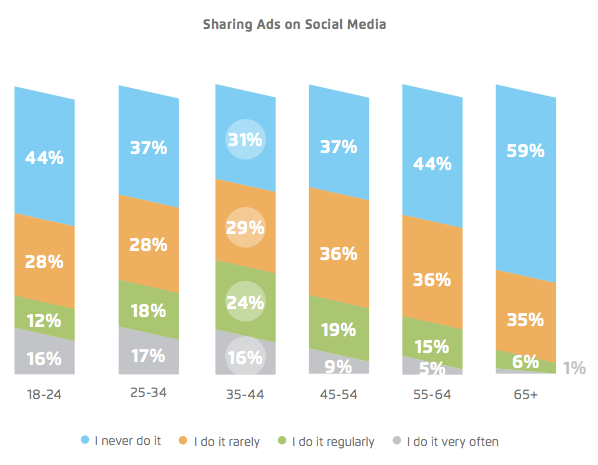 According to the survey, 63% of 25 – 34 year olds share mobile ads at least rarely; of 35 – 44 year olds, the percentage is 69%. This could be due to the fact that social networks (Twitter, Facebook) are a major delivery method for advertising on mobile and that sharing an ad is only ever one tap away. The “social proof” of ad distribution via social sharing would have an important impact on consumer sentiment towards mobile ads. Because of limited screen real estate, mobile app developers are judicious with ads. This argument has two parts. The first is a function of logistics: ads can only be so small and still remain readable, and few such ads can fit on the screen of a mobile phone. Ad formats are mostly limited to full-screen video, full-screen interstitial, and banner (with some new native ad formats gaining traction). The size of mobile device screens may simply limit the ability of app developers to misuse ads to the point where users are agitated by them. The second part is a function of app store distribution: because app discovery is mainly driven by advertising, the most desperate app developers — the ones most likely to plaster ads over every visible pixel of their app interface, akin to the worst AdWords offenders on the desktop web — are never able to amass enough of a user base to convince anyone that ads can be abused in mobile apps. The largest app developers (not necessarily the best, just the largest) with the largest user bases avoid ad saturation in their apps, and due to the nature of app discovery, the developers most likely to misuse ads command a relatively smaller proportion of users than do their counterparts on the desktop web. Whatever the reason, according to the report, mobile ads enjoy a privileged position of being perceived by consumers as additive to the mobile experience (or, at least, not detracting from it). This is a significant development; it means advertising formats could potentially evolve into creative media themselves without alienating users. Some developers have already begun experimenting with this concept: mobile ad network mNectar, for instance, sells a “playable ad” unit that emulates a game and forwards to the app store when clicked on. 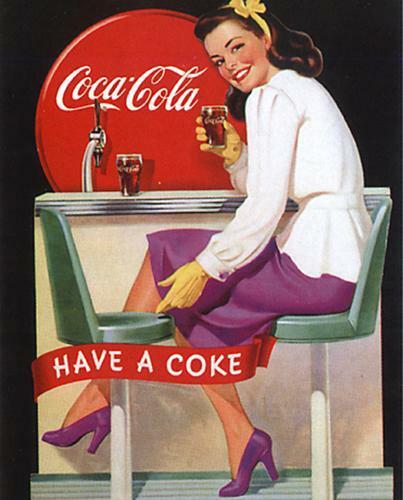 Of course, consumer sentiment might shift if the line between content and advertising becomes indistinguishable. Consumers may appreciate ads and the dynamics of ad-supported products on mobile now, but they certainly won’t appreciate being bamboozled into viewing ads under the guise of being served content. John Oliver broached this topic recently when he excoriated native advertising on his show. Advertising can be helpful — perhaps even seen as an independent form of content — but it shouldn’t be misleading or misrepresented. 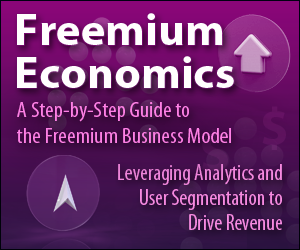 How much data is needed to predict LTV?